Saying farewell to summer, with sweet Georgia peaches! Last weekend, was our neighborhood annual lantern parade. This is such a fun night and even more so this year because our daughter Elle is old enough to enjoy all of the creative lights and music. On this night, we invite a few friends over, Kariim fires up the grill, I do the side dishes, and we make a signature cocktail. Since I had a few peaches left, we decided to put them on the green egg grill. They turned out delicious! Some of our guest added the peaches to their salad – while others put a scoop of ice-cream on them and enjoyed them for dessert. The peaches are very simple to make. You may caramelize to your liking. Rinse peaches well and cut into halves. Then sit aside. In a sauce pan, combine balsamic vinegar and honey – cook and stir over low heat 2-3 minutes or until smooth. Reserve 1/3 cup of the mixture for brushing peaches. Bring remaining mixture to boil over medium heat; cook and stir 4-6 minutes or just leave mixture until it thickens slightly (but do not over cook). Remove from heat. 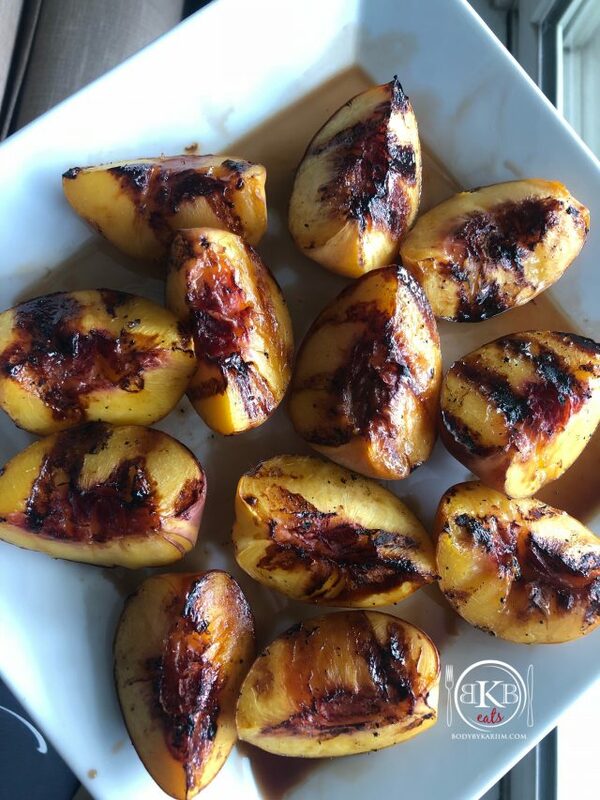 Brush peaches with some of the reserved balsamic mixture. Grill covered, on an oiled rack – over medium heat 6-8 minutes on each side or until cartelized. Brushing occasionally with remaining reserved balsamic mixture. Serve with glaze on ice cream, on a salad or just enjoy!